The University of Denver (DU) is a private research university in Denver, Colorado. Founded in 1864, it is the oldest independent private university in the Rocky Mountain Region of the United States. DU enrolls approximately 5,600 undergraduate students and 6,100 graduate students. The 125-acre (0.51 km2) main campus is a designated arboretum and is located primarily in the University Neighborhood, about five miles (8 km) south of downtown Denver. On March 3, 1865, John Evans, former Governor of the Colorado Territory, appointee of President Abraham Lincoln, founded the Colorado Seminary in order to help "civilize" the newly created (1858) city of Denver, which was then a mining camp. The seminary was founded as a Methodist institution and struggled in the early years of its existence. In 1880 it was renamed the University of Denver. Although doing business as the University of Denver, DU is still legally named Colorado Seminary. The first buildings of the university were located in downtown Denver in the 1860s and 1870s, but concerns that Denver's rough-and-tumble frontier town atmosphere was not conducive to education prompted a relocation to the current campus, built on the donated land of potato farmer Rufus Clark, some seven miles (11 km) south of the downtown core. The university grew and prospered alongside the city's growth, appealing primarily to a regional student body prior to World War II. After the war, the large surge in GI bill students pushed DU's enrollment to over 13,000 students, the largest the university has ever been, and helped to spread the university's reputation to a national audience. The heart of the campus has a number of historic buildings. The longest-standing building is University Hall, built in the Richardsonian Romanesque style which has served DU since 1890. The cornerstone to this building is exactly one mile above sea level. Just a few blocks off campus sits the historic Chamberlin Observatory, opened in 1894. Still a fully operational observatory, it is open to the public twice a week as well as one Saturday a month. The central campus area also includes Evans Chapel, an 1870s-vintage small church which was once located in downtown Denver, and was relocated to the DU campus in the early 1960s. Buchtel Tower (1913) is all that remains of the former Buchtel Chapel, which burned in 1983. The administrative offices are located in the Mary Reed Building, a former library built in 1932 in the Collegiate Gothic style. Margery Reed Hall (named for the daughter of Mary Reed) was also built in the collegiate gothic style in 1929. Margery Reed Hall has recently[when?] been designated to house the Undergraduate Program for the Daniels College of Business; an $8 million overhaul and renovation was just completed early 2014. The update for the building was to include more classroom space, a larger hall to host guest speakers, as well as mechanical and technical improvements. New (2018) construction on campus includes the rebuilding of the current Driscoll Center Student Union into a new "Community Commons," a new residence hall and a new, larger alumni/career center to replace the Leo Block Alumni Center. These project are slated for completion in the early 2020s. In 2005 the Graduate School of Social Work completed the renovation and significant expansion of its building, renamed Craig Hall. In autumn 2003, DU opened a new $63.5 million facility for its College of Law, what was later named the "Sturm College of Law." The building includes a three-story library with personal computers accessible to students. Donald and Susan Sturm, owners of Denver-based American National Bank, had given $20 million to the University of Denver College of Law. The gift is the largest single donation in the 112-year history of the law school and among the largest gifts ever to the university. The Daniels College of Business was completed in September 1999 at the cost of $25 million. The business school has been nationally recognized by organizations such as Forbes magazine, Business Week, and the Wall Street Journal where it is ranked second in the nation for producing students with high ethical standards. F.W. Olin Hall was built in 1997 to house Biological and Natural Sciences. Olin Hall promotes an exceptional collaborative learning and study space for DU science students. Additionally, the university opened the $70 million Robert and Judi Newman Center for Performing Arts, which houses the acclaimed Lamont School of Music. The center includes June Swaner Gates Concert Hall, a, four-level opera house seating just under 1,000, the Frederic C. Hamilton Family Recital Hall, a 222-seat recital hall with the largest (2,850 pipes) "tracker" organ in the region, and the Elizabeth Ericksen Byron Theatre, a flexible theatre space seating up to 350. The Newman Center serves as home to many professional performing arts groups from the Denver region as well as the University's Newman Center Presents multi-disciplinary performing arts series. In the last two years, DU has also built and opened a new building for the School of Hotel, Restaurant, and Tourism Management (Fritz Knoebel School of Hospitality Management). Inside the building there are numerous classrooms, a large wine cellar, meeting rooms, and an all-purpose dining room that hosts numerous city and university events, weddings, and formal parties. The school helps DU rank near the top of all hotel schools in the United States. The program had its first graduating class in 1946. The university has the 11th highest telescope in the world located at 14,148 feet near the summit of Mount Evans called the Meyer-Womble Observatory. This telescope is most commonly used by the university's Natural Science and Mathematics Department, and more specifically the Department of Physics and Astronomy at DU. Nagel Residence Hall was completed in the Fall of 2008 to house upperclassman and is one of the most unusual buildings on campus, offering a wide collection of art throughout the building donated by the Nagel family. The building is certified Gold in LEED standards to be environmentally friendly and more sustainable. As well as Nagel, Nelson Hall is another LEED residence hall that was built in the last eight years. DU completed the first ever (Peter S. Barton) lacrosse-only stadium that was specifically designed for the sport in 2005, as well as Ciber Field soccer stadium (2010) on the northern end of campus, adjoining the Nagel studio space for the School of Art, as well as the Pat Bowlen varsity sports weight training facility underneath the stands. The environmentally friendly $25 million Morgridge College of Education was opened in June 2010. At the beginning of the summer of 2011, the 41-year-old Penrose Library closed for a $32 million renovation, and reopened in the Spring of 2013 as the Anderson Academic Commons, a 21st-century high-tech collaboration and study space - one of the most advanced and technologically capable libraries among universities throughout the country. The university has five residence halls, Johnson McFarlane Hall (JMac), Centennial Halls, Centennial Towers, Nelson Hall and Nagel Hall. Johnson McFarlane Hall was energy star certified in September 2011 as one of the most energy efficient buildings on campus, and is the oldest co-ed dorm in the western United States. The University of Denver has an undergraduate student body of 5,758 in 2015, and a graduate student body of 6,389, with a total student enrollment of 11,476. The ratio of undergraduate women to men is 54% women to 46% men. Of the class of 2011, 67.0% are White, 2% are Black, 6.8% are Hispanic, 5.2% are Asian or Pacific Islander, 1-2% are American Indian, 11% are international (there were more than 1,400 international students as of 2013[update]), and 9.1% are race/ethnicity unknown. Around 63 percent of the student body is from outside the state of Colorado. For 2011 the average accepted high school student obtained a 3.74 GPA, SAT range of 1220 to 1500 and, an ACT of 28. Roughly over 50% of the incoming freshman class for 2011 was in the top 10% of their graduating high school class. The University of Denver likes to promote inclusiveness; therefore, there are numerous programs and people available to help transfer (or international students). There are International Student Advisors available to help with issues such as cultural adjustment and immigration. #76 Best Law School and #10 for its part-time law program. The undergraduate business program, The Daniels College of Business, was ranked 87th best in 2016 by BusinessWeek, and it was ranked the 71st best program by U.S. News in a 2008 ranking. The Creative Writing Doctoral Program in the Department of English, one of the oldest such programs in the nation, is ranked 1st by Poets & Writers magazine. The program was founded by the distinguished novelist, John Edward Williams, co-recipient of the 1973 National Book Award in Fiction, along with John Barth, for his novel Augustus. The Financial Times has ranked the Daniels College of Business Executive MBA program in the top 100 programs in the World in a 2011–2012 ranking. In a 2012 survey performed by the College of William and Mary and published by Foreign Policy Magazine, the Josef Korbel School of International Studies ranked 11th in the world for its graduate masters program, ahead of such schools as Syracuse, Yale, Stanford, University of California-Berkeley, Oxford and MIT. In 2006, Men's Fitness magazine ranked DU in the top-25 fittest colleges in America because the university actively promotes a healthy lifestyle for its students. The Coors Fitness Center has top-of-the-line equipment, personal trainers, nutritionists and fitness classes. Students also can play in 30 club and 22 intramural sports, and DU is located near some of the city's best recreational opportunities and the great outdoors. The University of Denver has almost 70.2% of its undergraduate student body study abroad before graduation, placing it first in the nation among all doctoral and research institutions in percentage of undergraduate students participating in study abroad programs. The Aspen Institute's 2011–2012 edition of Beyond Grey Pinstripes, a biennial survey and alternative ranking of business schools, recently[when?] ranked the Daniels College of Business the 15th best MBA program in the world. The survey puts emphasis on how well schools are preparing their students for the environmental, social, and ethical complexities of modern-day business. On October 3, 2012, the university hosted the first U.S. presidential debate of 2012. Students in the graduate programs represent over half of the total enrollment of the school. Aside from the Sturm College of Law, the university operates on a quarter system, sometimes known as trimester academic calendar, in which an academic year is divided into three academic quarters lasting 10 weeks per each quarter. This academic system allows students to take more classes each year than students in a more traditional 15-week semester system. Offering students a learning experience abroad, the Cherrington Global Scholars program offers every undergraduate the chance to study abroad at no cost above the normal university tuition, room and board. The art and music scene of DU is on the rise due to the recent construction of the Robert and Judi Newman Center for Performing Arts. This building houses the Lamont School of Music, the University of Denver Department of Theater, and the University's Newman Center Presents performing arts series. The Lamont School of Music is a structured conservatory setting which allows students to focus on their talents in a competitive manner. The theatre department, reestablished in 1985, is being transformed into a nationally competitive theatre school. With the recent addition of more faculty members and renovation beginning on Margery Reed Hall, the Theatre Department has become a magnet for theatre students in the region. Much of the faculty have many professional connections with local theatre companies (Curious, DCPA), as well as contacts in San Francisco, New York, Chicago, Los Angeles, and many other regions, providing students with many available options for internships and quick job placement. The university has established the Emergent Digital Practices program, focusing on art, design, media, culture, and technology studies in a hands-on, collaborative environment. Recently,[when?] the University of Denver Sturm College of Law has undergone an internal renaissance. In 2003, the University of Denver Association of Trial Lawyers of America trial team won the national championship in New Orleans, taking Harvard's title from the previous year. The Institute for Public Policy Studies (IPPS) boasts two former Colorado Governors as teaching faculty. Richard Lamm was joined in January 2007 by Bill Owens. As of 2017[update], the Daniels School of Business also offers an online MBA program. 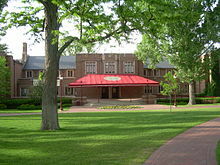 The Ricks Center for Gifted Children is a private school on the campus of DU that teaches preschool through eighth grade. Since April 1997, the school has been accredited by The North Central Association Commission on Accreditation and School Improvement (NCACASI). It was founded and is directed by Norma Hafenstien. For the past five years, University of Denver has been in the top five rank in the country of study abroad program for undergraduate students. On the 2015-16 academic year, DU had about 70 percent of participation leading them to be the fourth in the national rank. The director of the Office of International Education, Denise Cop, acknowledged that there is an increase in cultural self-awareness and knowledge of cultural worldview frameworks of the students that go study abroad. The top destinations of DU students are United Kingdom, Spain and Italy, however many students go to universities in Australia, New Zealand and Scotland. DU's Office of International Education also offers to their students support and advice for all undergraduate students who want to study abroad. DU's athletic teams are known as the Denver Pioneers. The school has been fielding athletic teams since 1867, winning 33 NCAA Division One titles since 1949—among the top 15 of all schools. Denver is best known as a major power in winter sports, in particular, skiing and ice hockey. DU has won 24 NCAA national team skiing championships (more than any other school). Ice hockey is DU's flagship spectator sport, with eight NCAA titles (tied for second among all schools), most recently in 2017 and including back-to-back crowns in 2004 and 2005. The program has produced 75 NHL players and regularly sells out the 6,000 seat Magness Arena on campus, the showpiece of the Ritchie Center for Sports and Wellness. The Pioneers' major conference affiliations changed in July 2013. Denver moved its primary affiliation from the Western Athletic Conference to The Summit League, hockey moved from the Western Collegiate Hockey Association to the National Collegiate Hockey Conference, and men's lacrosse moved from the ECAC Lacrosse League to the Big East Conference. In addition, the women's gymnastics team joined the newly formed Mountain Rim Gymnastics Conference in 2013 and later moved to the Big 12 Conference in July 2015. The Pioneers captured their first men's lacrosse championship in 2015, beating Maryland, 10-5. They are the first Division I men's team west of the Appalachians to win a men's NCAA lacrosse championship. The 2016 men's soccer team advanced to the NCAA College Cup. ^ Separated brethren: a review of Protestant, Anglican, Eastern Orthodox & other religions in the United States. Our Sunday Visitor. Retrieved March 27, 2010. Among Protestant denominations, Methodists take first place in hospitals and colleges. Some of their one hundred colleges and universities have all but severed ties with the denominations, but others remain definitely Methodist: Syracuse, Boston, Emory, Duke, Drew, Denver, and Southern Methodist. The church operates three hundred sixty schools and institutions overseas. Methodists established Goodwill Industries in 1907 to help handicapped persons help themselves by repairing and selling old furniture and clothes. The United Methodist Church runs seventy-two hospitals in the United States. ^ "Schools by Jurisdiction". United Methodist Church. Archived from the original on December 16, 2009. Retrieved December 14, 2011. ^ "NAICU – Member Directory". Archived from the original on November 9, 2015. Retrieved December 7, 2016. ^ As of June, 2013. "University of Denver Endowment Funds" (PDF). University of Denver. June 30, 2017. Retrieved February 1, 2018. ^ a b c d "University Factbook". DU.edu. Retrieved May 2, 2017. ^ "University Factbook". DU.edu. Retrieved May 2, 2017. ^ University of Denver (August 1, 2008). "University of Denver – The Look of Campus". Archived from the original on July 3, 2007. Retrieved August 1, 2008. ^ University of Denver Brand: Visual Guide (PDF). Retrieved April 16, 2016. ^ University of Denver. "Facts & Figures". dDU.edu. ^ Form W-9, Request for Taxpayer Identification Number and Certification. University of Denver. Retrieved on November 26, 2016. ^ "The University of Denver's Historic Chamberlin Observatory". Denver Astronomical Society. Archived from the original on February 18, 2015. Retrieved August 27, 2014. ^ "University of Denver Daniels School of Business Denver, Colorado". Grad Profiles. Retrieved March 30, 2019. ^ "2014 National Universities Rankings". Washington Monthly. n.d. Archived from the original on August 28, 2014. Retrieved May 26, 2015. ^ "Best Part-time Law Programs". U.S. News & World Report. Archived from the original on July 29, 2017. Retrieved July 28, 2017. ^ "The Top Undergraduate Business Programs". Bloomberg Businessweek. Archived from the original on May 8, 2010. Retrieved August 5, 2012. ^ Staff (September 1, 2011). "2012 Creative Writing Doctoral Program Rankings: The Top Fifteen". Poets & Writers. Retrieved August 5, 2012. ^ FP Staff (January 3, 2012). "Ivory Tower". Foreign Policy. Retrieved February 6, 2012. ^ Johnson, Hugh (November 18, 2014). "University of Denver ranked number one in percentage of students who study abroad". The Denver Post. Retrieved November 18, 2015. ^ University of Denver. "Colorado Women's College". DU.edu. ^ University College, University of Denver. "Continuing Education". UniversityCollege.DU.edu. Retrieved March 30, 2019. ^ "Gilbert E. Carmichael papers MSS.338" (PDF). Mississippi State University Libraries. Retrieved May 5, 2014. ^ "Study Abroad". DU.edu. Retrieved September 28, 2013. ^ "The University of Denver Law Students Win National Mock Trial Competition in New Orleans". American Association for Justice. March 28, 2003. Archived from the original on July 4, 2008. Retrieved September 28, 2013. ^ "Earn an Accredited MBA Online from the University of Denver". University of Denver. Retrieved June 20, 2018. ^ Stone, Jon (November 13, 2017). "DU Recognized for Study Abroad Program". DU.edu. Retrieved November 16, 2017. ^ "About DU". DU.edu. Retrieved August 21, 2013. ^ Chiaramonte, Perry (August 20, 2013). "Daniel Boone-like mascot for Denver college deemed offensive by administration". FOX News. Retrieved August 21, 2013. Wikisource has the text of a 1921 Collier's Encyclopedia article about University of Denver. Wikimedia Commons has media related to University of Denver.